In the 1980s, Voyager 2 discovered a dark storm in Neptune’s dense atmosphere, and now the Hubble Space Telescope is tracking Neptune’s storms. More in this NASA video. Jupiter’s Great Red Spot is known to be a giant hurricane that’s raged for centuries at least. Likewise, the 8th planet Neptune has great storms, but they’re tougher to see and track because Neptune is smaller and farther away at some 3 billion miles (5 billion km). In the late 1980s, the Voyager 2 spacecraft discovered huge dark storms in Neptune’s dense atmosphere. Since then, only the Hubble Space Telescope has had the capabilities to track these elusive features over the years. Hubble found two dark storms on Neptune that appeared in the mid-1990s, then vanished. It found Neptune’s latest storm in 2015, and now it’s watching that storm shrink. The particles themselves are still highly reflective; they’re just slightly darker than the particles in the surrounding atmosphere. The elusive feature gives astronomers a unique opportunity to study Neptune’s deep winds, which can’t be directly measured. This series of Hubble Space Telescope images taken over 2 years tracks the demise of a giant dark vortex on the planet Neptune. The oval-shaped spot has shrunk from 3,100 miles (4,990 km) across its long axis to 2,300 miles (3,700 km) across, over the Hubble observation period. Image via HubbleSite. The early images of the dark storm on Neptune are from the Outer Planet Atmospheres Legacy (OPAL) program, a long-term Hubble project that annually captures global maps of our solar system’s four outer planets. Jupiter’s Great Red Spot has been known much longer; astronomers with small telescopes first spotted it in 1831, and it’s been watched continuously since the 1870s. We have no evidence of how these vortices are formed or how fast they rotate. It is most likely that they arise from an instability in the sheared eastward and westward winds. Neptune-watchers say the dark vortex on Neptune is behaving differently from what they expected. Dynamic simulations suggested that anticyclones under Neptune’s wind shear would probably drift toward the equator. Researchers expected the storm to break up and perhaps create a spectacular outburst of cloud activity. Instead, Neptune’s dark spot has apparently faded away rather than going out with a bang. Neptune’s shrinking storm, via HubbleSite. Bottom line: NASA video about storms on Neptune, the 8th planet. Voyager 2 discovered a dark storm on Neptune in the 1980s. 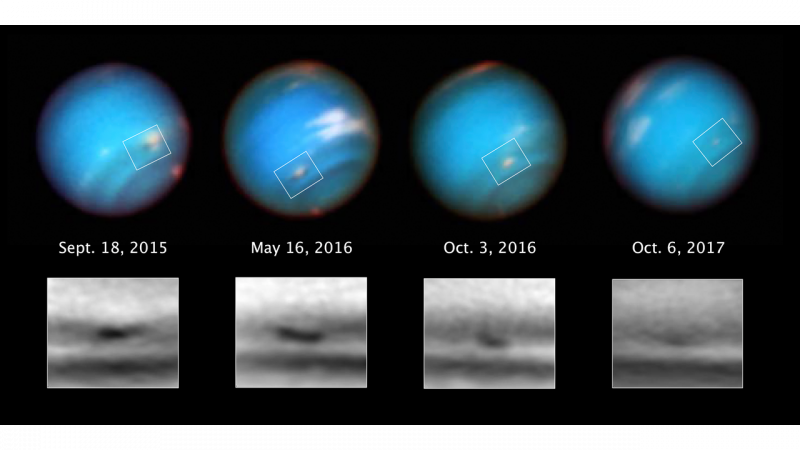 Now the Hubble Space Telescope, which tracks Neptune storms, has, for the first time, seen one as it’s dying.